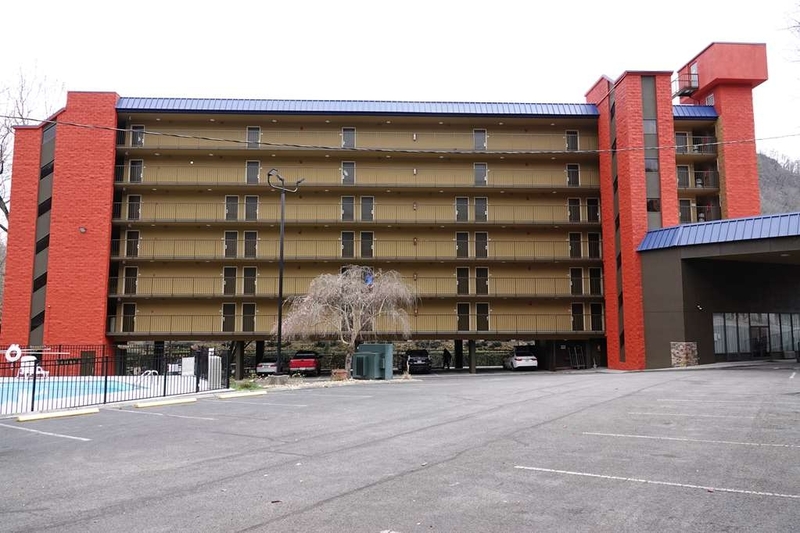 The SureStay Plus Hotel by Best Western Gatlinburg is ideally located in the center of Gatlinburg. Come and experience our hotel near the major tourist attractions. Best price guaranteed and exclusive deals. 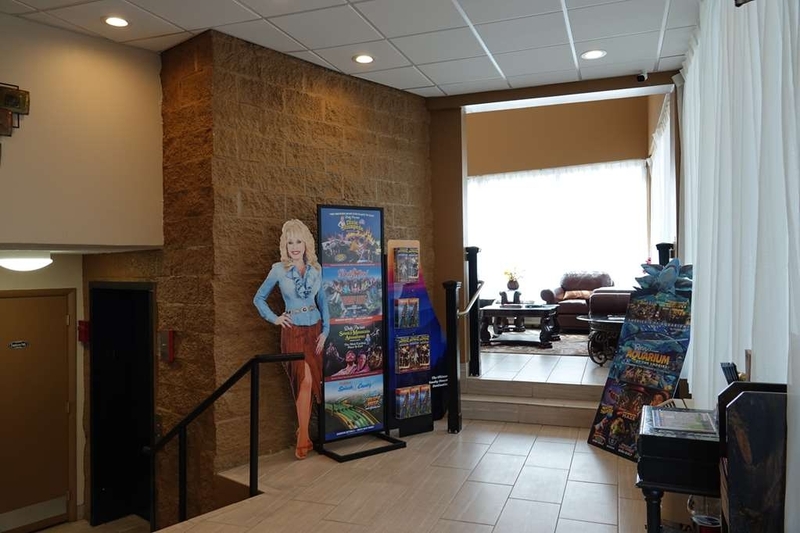 Welcome to the SureStay Plus Hotel by Best Western Gatlinburg! No matter what time of year, we know you will love staying at our hotel. 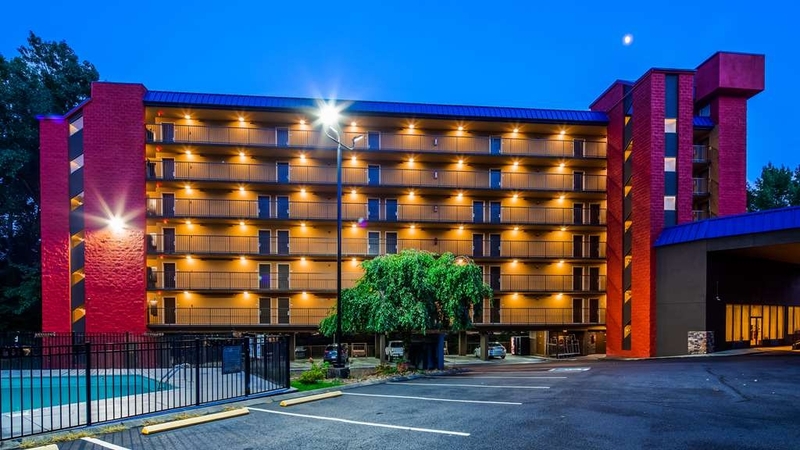 The SureStay Plus Hotel by Best Western Gatlinburg is the perfect spot for your next visit to Gatlinburg. 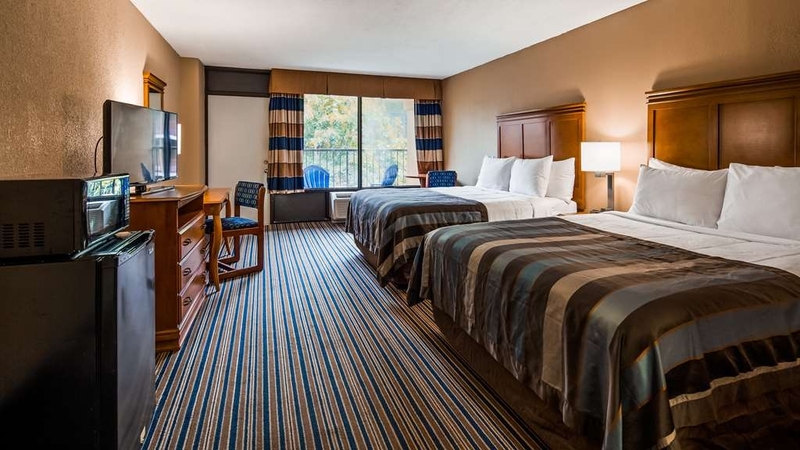 Your comfort comes first at the SureStay Plus Hotel by Best Western Gatlinburg. 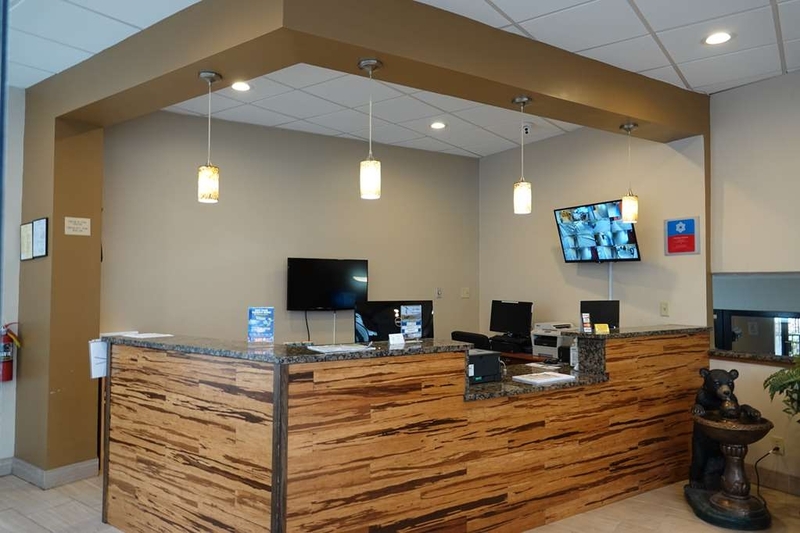 Make sure you visit our front desk staff for any questions regarding Gatlinburg! First impressions are the most important, and our lobby is no exception to that rule. 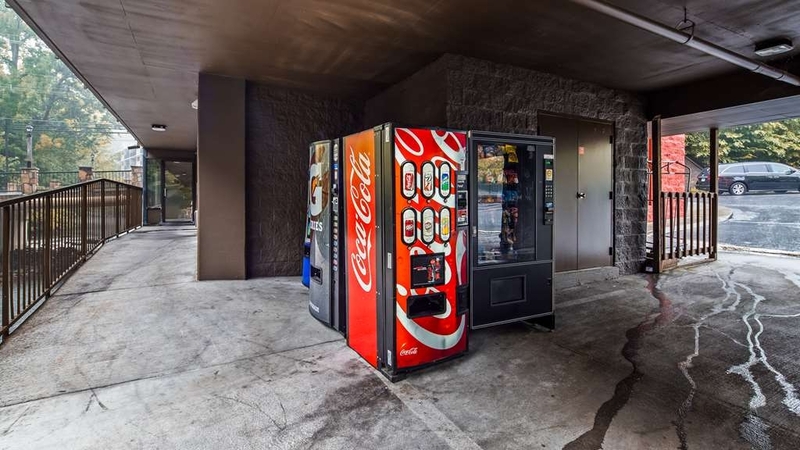 If you looking for a late night snack stop by our onsite drink and vending machine. 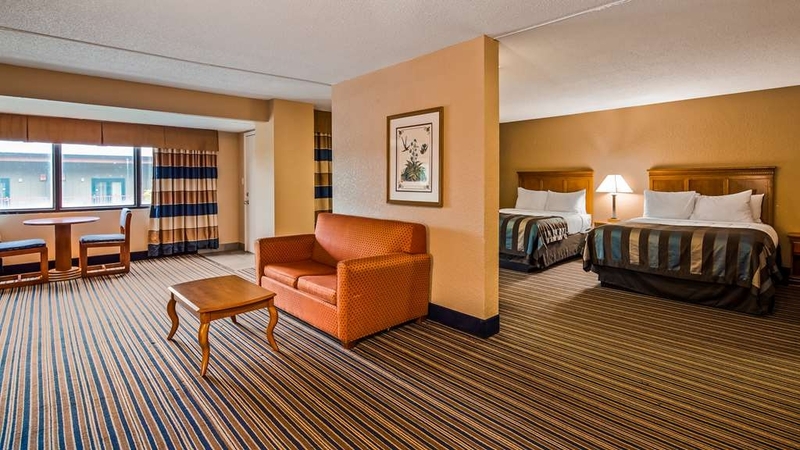 Stretch out and relax in any of our king standard or king mobility accessible rooms. 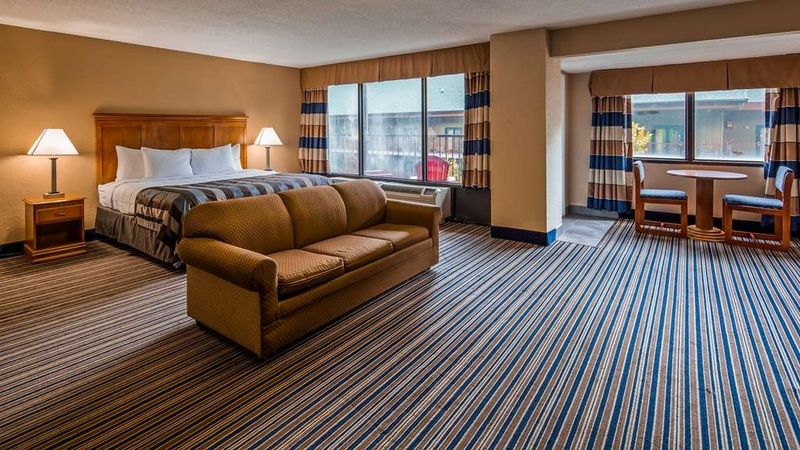 Pull back the covers, hop in and catch your favorite TV show in our king rooms. Make a reservation in any of our standard or pet friendly 2 queen rooms featuring a river view and balcony. Your comfort is our first priority. In our 2 queen room you will find that and much more. 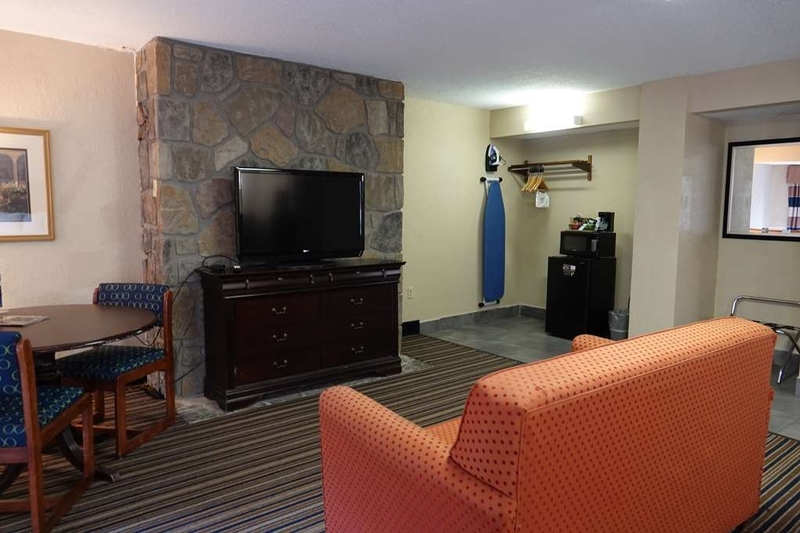 We offer a variety of king suites from standard to mobility accessible to pet friendly. Live in true luxury when you book a king suite bedroom. Make a reservation in this king spa suite featuring a balcony, spa bathtub, review view, extra seating area and free Wifi. This king spa suite offers plenty of space to work, watch TV and get a good nights rest. Upgrade yourself and relax after a long day in our king spa suite featuring a spa bathtub. We offer a variety of 2 queen suite featuring standard, pet friendly and spa bathroom. 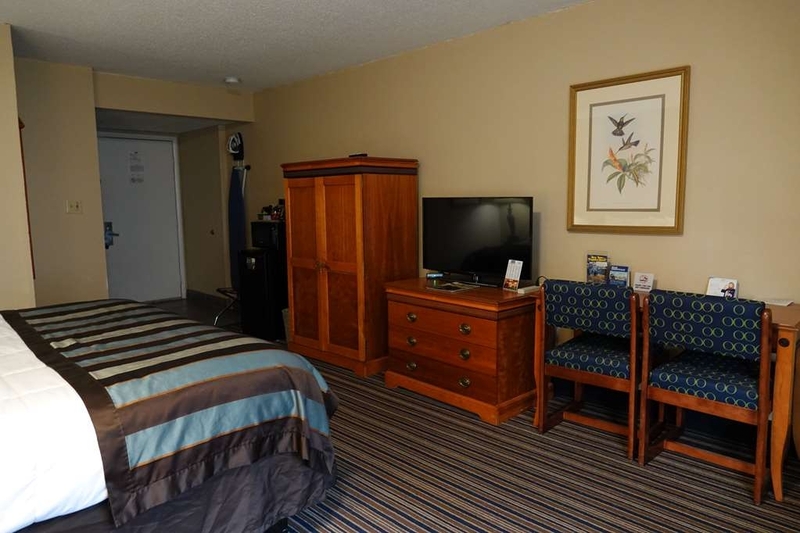 This 2 queens suite guest room is perfect for a layover, extended stay or weekend getaway. There’s plenty of space in our 2 queens spa suite for sleeping, eating and working. 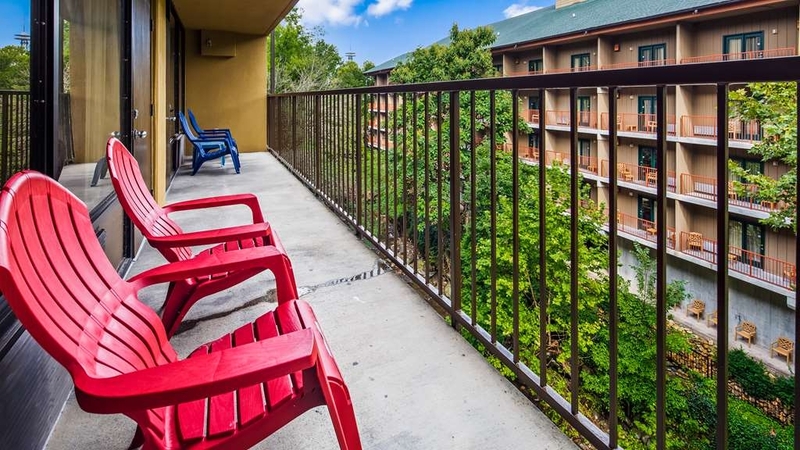 Read a book or enjoy Gatlinburg while sitting outside on your hotels balcony. 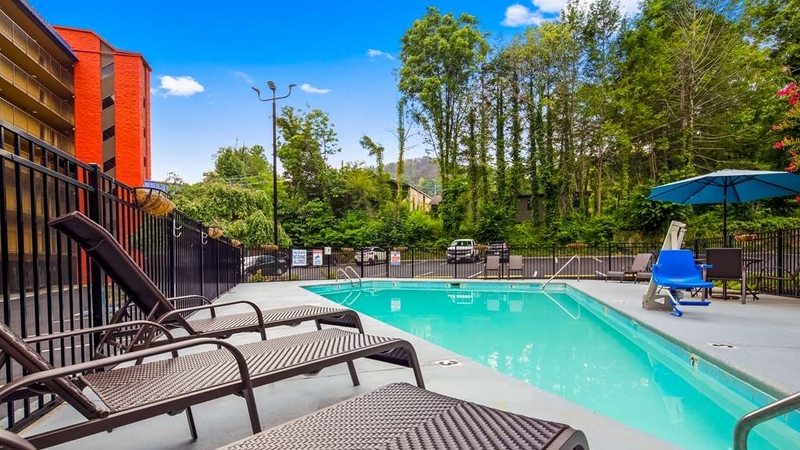 The SureStay Plus Hotel by Best Western Gatlinburg features views of the West Prong Little Pigeon River. 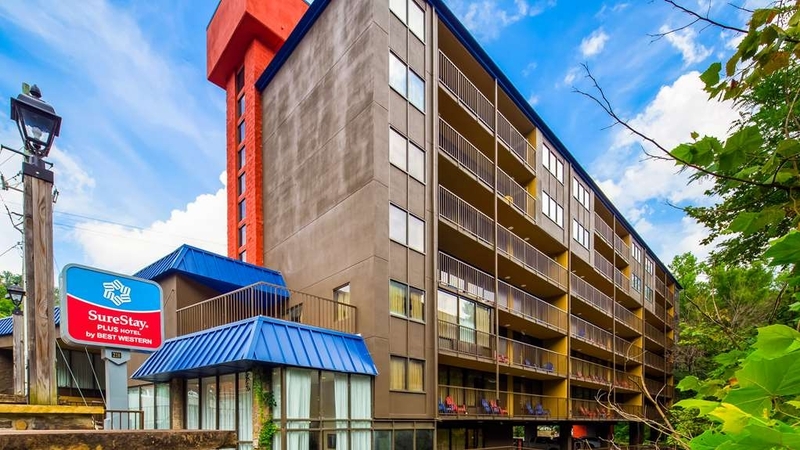 The property is located walking from Downtown Gatlinburg and popular attractions such as Ober Gatlinburg and The Great Smokey Mountain National Park. Each rooms has a shared balcony, flat-screen TV, microwave, refrigerator and a coffee maker are also provided. Every room is fitted with a private bathroom and has a hairdryer. 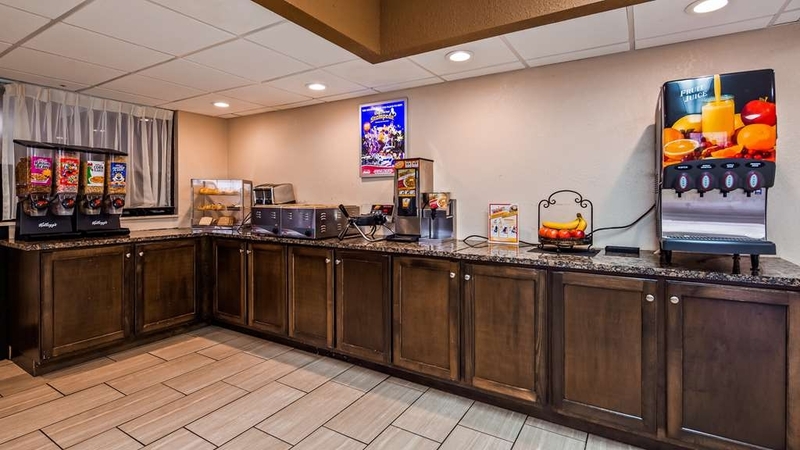 A daily housekeeping service is provided, we have a 24-hour front desk, free parking, vending machines and an ATM machine are on-site for our guest’s convenience. The Great Smoky Mountain National Park is just 0. 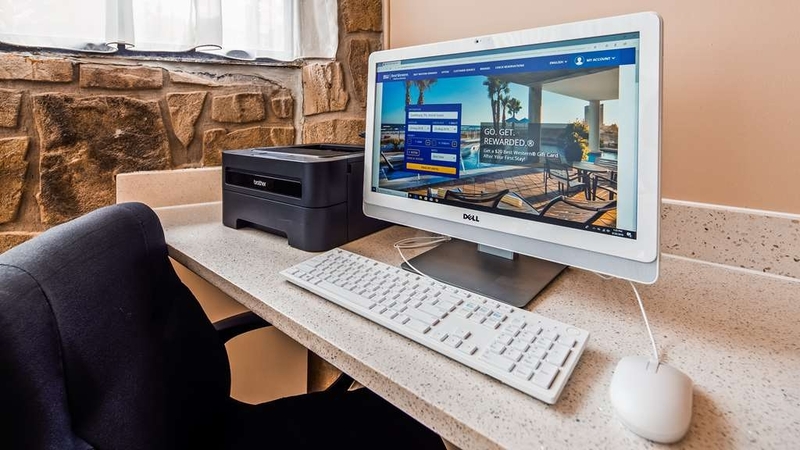 5 miles away, Cherokee is 20 miles, Knoxville is 28 miles, the nearest airport is McGhee Tyson Airport which is 42 miles from SureStay Plus by Best Western Gatlinburg. Thank you you for your kinds review Alan. We are so happy that you enjoyed your stay with us. We strive to provide our guests with the best service and comfort possible. We will be looking forward to having you stay with us again next time you are in town! Thanks again for staying with us here at SureStay Plus by Best Western. We stayed the weekend and didn't want to leave. Room was big, bed was comfy and balcony was relaxing. Breakfast was good and everyone in my group enjoyed there stay. Plenty of sleep space for families. Dear Journey44150890255, Thank you for taking the time to let us know how you enjoyed your stay. It is great to hear from you and your compliment to our services, amenities and breakfast. We appreciate your five-star review and we look forward to serving you again. "Surestay Plus Hotel by Best Western"
Dear Adventure03835214005, Thank you for sharing your heartfelt review. It is great to hear from you and I am so glad that you enjoyed our staff courtesy and have taken the time to recognize the hospitality and care that we aim to provide for each of our guests. We appreciate your kind compliment to our staff, breakfast and the wifi, Your comfort and convenience are our top priorities and thank you for letting us know how we have been successful in our efforts to impress you. Thank you for the high rating and we look forward to serving you again. THE GOOD-Great view of the river, friendly staff, covered parking, budget friendly, clean rooms. Veteran discounter, decent hot breakfast. THE BAD- shared balconies and faces balconies of hotel next door. Dear Hanberry84, Thank you for taking the time to share your great review. We are indeed grateful that you find our place excellent and comfortable. Thank you for your compliment and It means a lot to hear from guests who are satisfied with all of our services and amenities. Thank you for the high review and we look forward to serving you again! Dear Valued Guest, It is wonderful to hear that you and your husband enjoyed your stay and that you have rated our hospitality and accommodations so highly. We are happy to have met your expectations with our friendly services and the cleanliness of our guest rooms. Thank you for your feedback, we shall definitely work on your observations. You can expect a further improved stay next time. We can't wait for your next visit. Dear Chelsea, Thank you for sharing your experience, and I am so sorry to learn that we failed to meet your expectations of quality service and accommodations. We apologize for the cleanliness issues in your room. I assure you that we have the highest standards of cleanliness and that your comments are very important to us and addressed immediately with our housekeeping staff. Your satisfaction is important to us and we will be using the feedback you provided to make improvements to ensure we offer an exceptional experience for our guests in the future. I hope that you will consider staying with us again so that we can have another chance to provide you with a superior experience. Dear NorthStar02300463055, Thank you for taking the time to share your review. I'm glad that you found our location convenient for your needs at a reasonable cost. Although I am saddened that you encounter these kinds of problems like the bathroom and bugs. Please know that we will address this immediately. We appreciate your time in pointing out the areas in most need of attention as we work towards updating and improving upon our accommodations.We also appreciate your suggestions for improvement and look forward to impressing you during future stays. Stayed here for 5 nights. King suite. Hotel pictures online are very deceiving. Our suite had an odor that never went away. The room itself was very old and missing tile in the bathroom. Bed was rock hard. Rotting wood that lead out to the shared balcony. The hotel breakfast was below the standards of a Best Western as well. I wouldn't recommend staying here. Dear brendamO5251SN, Please accept our sincerest apologies for the housekeeping issues that you encountered during your stay in our hotel. We take all reports of lacking service and issues with amenities and accommodations seriously, particularly those that you have raised. I apologize for the inconveniences that you experienced and I want to assure you that we are continuously improving through guest feedback and suggestions. We do hope to serve you again soon so that we may change your opinion at our hotel. The hotel was great. The room was very clean. It is within walking distance of attractions, food, and park, but was on the backside so no noise. I actually left a bag and they called to let me know how to get it back. They called to advice me of each step in getting my bag returned. I will definitely stay again. Your five star review means a lot to us Linda S! 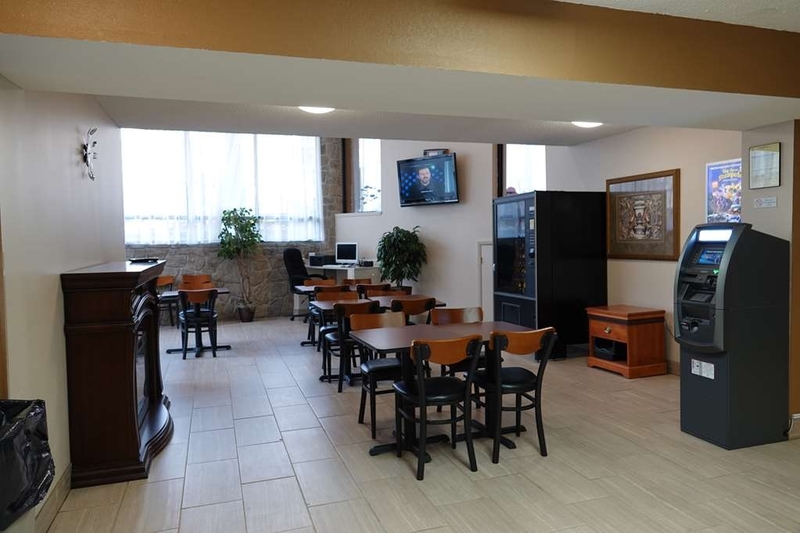 We are happy to hear that you found our location to be so convenient while staying with us near at the restaurants , and park at a reasonable cost. We hope you were able to explore the area! We value our customers well and we are happy that you stayed with us! Thank you very much. Dear Zackyboy239, Thank you for bringing to our attention your experience and comments regarding your stay in our hotel. I want to assure you that we are thoroughly investigating this claim, we are taking the necessary precautions to ensure that nothing is missed. I want to assure you that we respond promptly to pest alerts with expert extermination services and also treat to deter pests on a regularly scheduled basis. Thank you for your business and we hope you'll consider us again on your next visit. We stayed here during our weekend conference. We couldnt have been more satisfied. Had a couple of issues but they fixed them right away! We look forward to staying here again. The office staff were a great help. The breakfast foods were tasty and satisfying. The rooms were well cleaned. Beds are extremely comfortable and slept well. Being beside the little river was very relaxing. It was close to great attractions and restaurants. We need more great vhoices like these. Hi Camper42820188762, Thank you for taking the time to leave a review. We are glad to learn that you had a comfortable and convenient experience and that you are satisfied with our services. Thank you for your kind review and compliments to our staff and breakfast options. We seek to give each guest a very comfortable and accommodating experience and we are thrilled to hear of our success in this ambition. We hope to serve you again in the future. What a great spot. October 11th, 2018 small group of us traveled via motorcycle from Groton CT to attend an event in Gatlinburg TN. We arrive a little after 1130 pm and check-in went very well. Although the room was clean it had a smell to it. Not sure what the source of the smell was but we got used to it. We enjoyed the location. It was cool to sit out back and listen to the sound of the small river that ran past the hotel. The hotel is located a short distance from just about everything. The breakfast was good and served as a great start to the day. I would stay hear again. Vernon P, I am so sorry that you smelled of unpleasant in your room. In the future please address immediately so that our staff will clean and disinfecting to restore the clean smell of our accommodations. Thank you for bringing this matter to our attention so that we can make sure no future guest experiences the same inconvenience. We stayed one night on the way home over Christmas break. We had to wait an hour after check in to get to our room because it wasn't ready yet. Once we got to our room we found that the bathroom was dirty with hair and grime all over. The windows leaked and water pooled on the inside. There was mold in the room on the ceiling and in the corners of the wall. The light switch was located BEHIND the microwave. Will not stay again. "I would recommend this hotel to anyone we stayed in a condo..."
Thank you for your kind review! We are so happy that you enjoyed your stay with us! We have lots of renovations planned for the beginning of the year. We are sure you will be even more impressed with the lodgings on your next visit. Your business is appreciated, and we look forward to seeing you again the next time you're in town. Thank you for choosing to stay with us here at Sure Stay Plus Gatlinburg! This hotel is old and dirty. Unfortunately ut does not live up to the Best Western Brand name. I was very surprised to see how dirty our room was upon arrival. I tried to shake it off and maintain a joyous attitude for my family. However, it was as though housekeeping only half heartedly cleaned. Most notably, there was a cup full of cigarettes on the balcony and ashes all over. Black mold appeared to be growing in the corners of the room and on the outside window. Scuff marks covered the walls and bathroom door. The fireplace has been, "Shut down" for good. I tried to make the best of it and not complain. We dropped our stuff off and left for the afternoon. After a full evening we returned around 11pm. I put on my nightgown turned off one light and as soon as I did, three roaches crawled out of hiding. I can deal with not so clean... I can't deal with roaches. We got dressed and checked out immediately. They did refund our money which I appreciated. I was taken back by the receptionist's response when I told her our room had roaches. She stated they just sprayed that week and she has not had any complaints from THAT room.... that room? Like people have complained of multiple other rooms? I wouldn't recommend this hotel. Thank you for taking the time to rate us. We deeply regret that you were not pleased with your room. We will be sure to look into your complaints. Your business is appreciated, and we hope you will give us another chance in the future Thanks again. Devon was great when I got lost getting there and in extend my stay. The hotel suite was like an apartment. 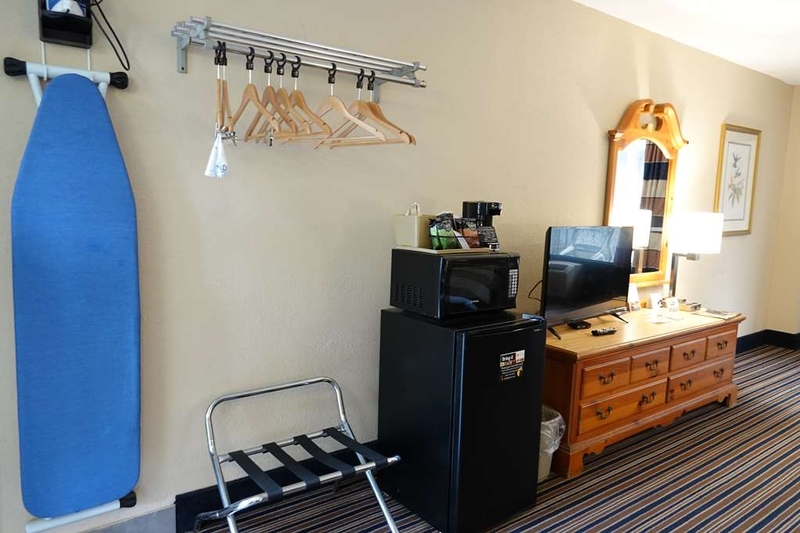 The hotel is great for people who like to walk because it is near the major attractions. Can't wait to book again next year. Thank you for your kind review! We are so happy that you enjoyed your stay with us and that Devon was helpful to you. Your business is appreciated, and we hope you will choose to stay with us again the next time you're in town. Thank you for staying with us here at Sure Stay Plus Gatlinburg! I stayed here for one night while visiting the Great Smokey Mountains. 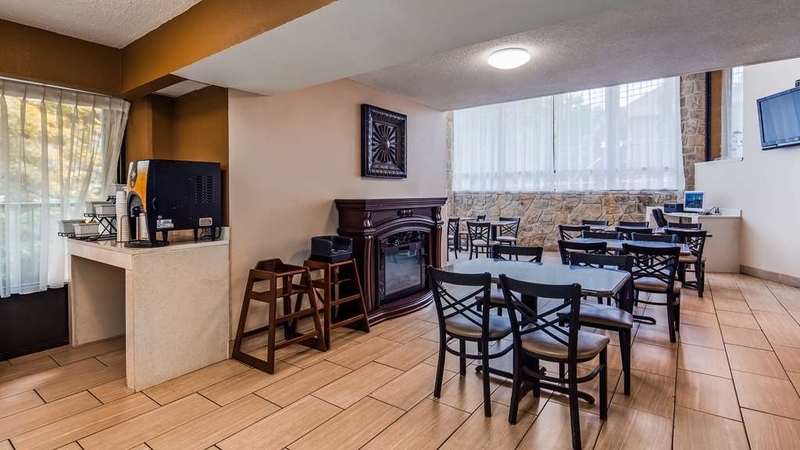 It is one of the nearest accommodations to the park entrance but still close enough to the main street of Gatlinburg. Rooms were quite average, clean but the decor was a little worn. One thing that I really did not like was the balcony; there was no privacy as you were sharing with 2-3 other rooms, so you had to keep the curtains pulled and the door locked. The other thing that was an issue was the elevator, it was soooo slow. I just ended up using the fire escape stairs which was quicker even though I was on the fifth floor here is a breakfast available in the mornings which was ok. Reception staff were quite friendly and welcoming. Thank you for taking the time to rate us. Your input is very important to us and will considered. Please be assured that we have major renovation projects scheduled to begin after the first on the year. The privatizing of the balconies are one of the thing under discussion. We are confident you will find the accommodations much improved should you choose to stay with us again in the future. Thanks again! "Good Location - Needs Updating"
The room was decently clean. Some dirt. The rooms really need to be updated. It has doors that are on the outside of the building, not within, which can make you feel less safe. We were okay though. The staff was nice and attentive. The free breakfast was good with a variety of food. I would say the free breakfast was average for Best Western. The area is very close to downtown Gatlinburg, but Gatlinburg itself was very crowded. I'd stay at the hotel again, if I stayed in Gatlinburg again. I probably won't be staying in Gatlinburg again, however. Thank you for taking the time to rate us. Your input is very important. Please be assured that we have major renovations that will start to be implemented after the first of the year. Your business is appreciated, and we hope you will choose to stay with us again if you do decide to come back to the area. I would suggest March or April, during the week so it wont be so busy Thanks again! Arrived at the Surestay Plus Hotel, which is ran by Best Western,the front desk clerk left us checkin early instead of the normal 3:00 checkin time, very friendly staff and rooms were very clean,looking forward to going back again sometime!Highly recommend!! Thank you for your kind review Dawn! We are so happy that you enjoyed your stay with us and that our staff was able to accommodate your needs. Your business is appreciated, and we will be looking forward to seeing you again the next time you're in town. Thank you for choosing to stay with us here at Sure Stay Plus Gatlinburg! "Not a typical Best Western standard"
We were there for two nights al the last minute so it ward to find any accomodation in Gatlinburg. Location is not really on the main area but not that far to walk. So were happy. Several nice steakhoue and other restaurants within 1/2 a mile. Our room had two queen bed and comfortable mattress and clean with microwave and refrigerator. Even though when we booked the room it said continental breakfast but got waffles, scrambled eggs, sausages, bagel, bread and danish, muffuns. It was great since we did not expect it. The check in staff were very friendly and helpful. Only thing I would suggest is they need to renovate big time. It was kind of dillapidated. Other than we enjoyed our stay. Thank you for your review! We are so happy that you enjoyed your stay with us! We do have plans for some major renovations starting next year. We are replacing the carpets and windows through the entire facility as well as other small improvements. Your business is appreciated and we hope you will stay with us again the next time your in the area. 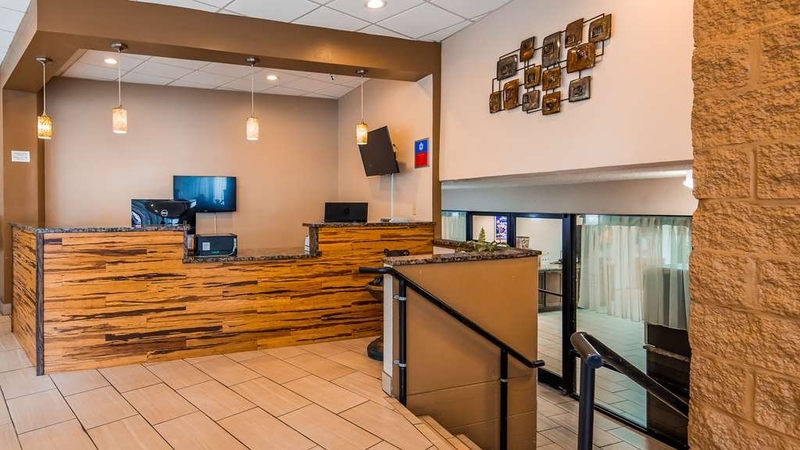 We are confident that you will have an even better experience with us Thank you again for staying with us here at Sure Stay Plus in Gatlinburg! "Don't waste your money, Worse hotel ever"
We went to Gatlinburg with another couple, we chose this hotel since it was in walking distance to the strip. From the moment that we walked into our room it was just awful. We had a heavy smell of pot coming from the room under us that was coming up through the fireplace. We complained at the desk but it didn't help. The other couple took that room, since we have breathing issues and we took the other room that we had, that was no better, the room was dirty, nasty and the view of the creek is a joke, since the windows are so dirty that you can see out them. If you do go out on the patio you will be sharing it with the 2 rooms next to you. The bathrooms are gross and need to be updating. They had all plugged into one outlet the coffee maker, fridge, and microwave has to be a safety issue. The free breakfast is disgusting, the eggs didn't like any egg we had ever had before. This place needs to be shut down and totally redone, Best Western should be ashamed to be connected to this hotel. There is so much mold in the rooms, that when we got home my husband had to go to the dr's and get antibiotics and steriods. He also missed 3 days of work, so we had that expense after staying in this location. When we checked out the owner was at the front desk and asked about our stay.. we told him that we were very unsatisfied all his response was " oh sorry". When we got home I was still upset about the stay that I reached out to Best Western Corp. I emailed them directly and they directed the owner to contact me directly. I held off on posting this review to give them a chance of answering my concerns, The owner has never contacted me nor do I expect him ever to do that. So all I can say is to never stay at this location. I am also posting my pictures so you can see for yourself. "Ashamed for Best Western logo!" 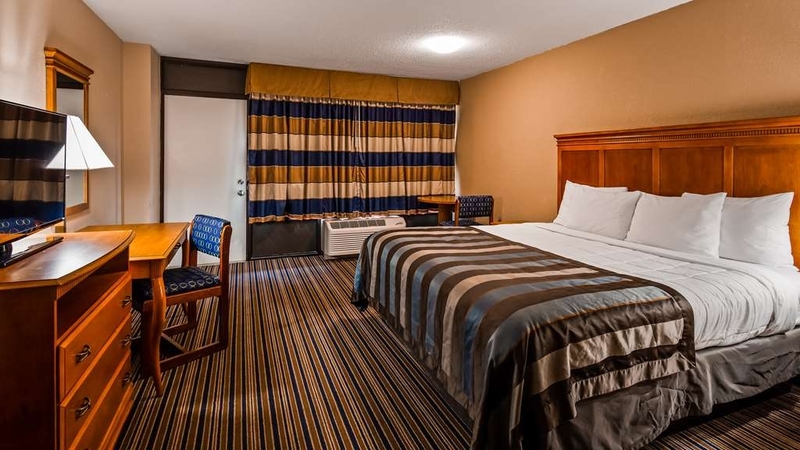 We have come to Trust Best Western for clean, comfortable rooms as we travel. NOT SURE STAY in Gatlinburg!! You could not see out the windows for all the filth! The balcony view was perfect but looked as if it had never been swept and each time we stepped out, the neighbors dogs acted as if they would eat us! The floors were sticky, the toilet flushed only slightly, the whole place is run down!! We do NOT appreciate spending good money for a dump like this! The breakfast was horrible, the juice machine was not turned on, the hot breakfast was cold. The Lobby was dirty and allcthe workers appeared lazy!! Best Western, you need to do something about this place!!! Thank you for taking the time to rate us. We deeply regret that you were not pleased with your room. We will be sure to look into your complaints. Please be assured that we are making regular updates to the facility. We have some big projects planned for early next years such as replacing all the windows and carpets. Also, we will no longer be a pet friendly location next year. We are confident you will find everything much improved should you choose to give us another chance in the future. Thanks again! This hotel is decades old, and it's changed names several times, but it's a good deal and a great location. The property is currently a Best Western (since April). The rooms are large and updated, with a balcony overlooking the "river" below. You get a free breakfast, and free parking too. Wi-fi signal was very good in our 4th floor room. However, what sells the hotel is it's location. We've been to Gatlinburg many times, and it's a HORRIBLE place to drive around in. It's difficult to find parking downtown, and at peak times even getting in and out of the national park is rough. That's how it was when we were there this weekend. So, to stay in a hotel that's inexpensive and one block from Light #10 is a huge deal. We only had to drive into the park. Downtown was an easy walk from the Sure Stay Best Western. The front desk person was nice, the room always clean when we came back at the end of the day. That's really all I want in a cheaper hotel. We've stayed up on top of the mountain before and had the great views from our room. This time we only wanted convenience, and his hotel provides that. We'd stay here again. Thank you for your kind review Greg! We are so happy that you enjoyed your stay with us and that our location is convenience for you! Your business is appreciated, and we hope you will choose to stay with us again the next time you're in town. Next year we will be undergoing some major renovations, so it will be even better the next time you visit with us. Thank you for choosing to stay with us here at Sure Stay Plus Gatlinburg! First thing I noticed going into the bathroom was a thick, hairy black mold growing under the toilet bowl rim.. spots on the bathroom floor. Check is was 3p.m. we did not get to check into our room until 6. No towels ever changed out. when I would get back into the room at night I had to go look for towels.. office staff were always out smoking. on the last night a elderly man and small boy brought me towels at 9 p.m. I was over charged and could not understand the foreign man at the office. The so called breakfast bar never had one thing on it filled. I guess when she brought out the small bowl you had to be there.. said it opened at 7:30 NO FOOD.. and, when you asked if she was bringing anything out she would say I have to go cook it.. well, the eggs were some kind of odd powdered mix and nothing was good but still you are entitled to it.. NO yogurts ever brought out.. She brought out 2 one morning.. Trash never taken out. I had to go out in the middle of the night and look for a trash bend.. NO one answered the desk.. I guess smoke break. Trash can at the end of walk on my floor had trash spilling out of it and on top of it and it was NEVER cleaned up the 4 days I was there. Spiders were hanging from all the lights on the walk way in front of rooms. Thank you for taking the time to rate us. We deeply regret that you were not pleased with your stay. We will be sure to look into your complaints. Please be assured that we are making regular updates to the facility and we hope you will find it much improved should you choose to try us again in the future. Thanks again! We always stay on the strip somewhere and decided to try this one out (not directly on the strip btw.) Check in was fine, Tina was fantastic. We got to our room only to notice 2 of our lights did not work. Called Tina up and she said she would put in an order to have them changed the next day. Eventually they started to work for a little while then would go back off. These lights were the ones over the TV and over the mirror in the bathroom. Right after that my husband killed a katydid above the door frame. Then I tried to plug my phone charger up, the outlet behind the bed wouldn't work. Tina did give a great recommendation for pizza delivery and was very helpful for information on the area. The next day we had breakfast, which was good. Half hot (biscuits, gravy, eggs, sausage) and half continental. Room was very spacious with a shared balcony. Bathroom floor was filthy. Luggage carts are hard to get hands on during check out. Overall an OK stay but will stick with what we know and book somewhere else on the strip. Thank you for taking the time to rate us Britney. We sincerely apologize that there were maintenance issues with you room during your stay. Thank you for bringing them to our attention. Your business is appreciated, and we hope you will give us another chance in the future. Thanks again! This is a really great place. The front receptionist (dreammy) always greets people with a beautiful smile and she's always attentive. The staff is really friendly they always tried help in any way possible. The rooms are very clean and spacious, the pool has a nice view of the city. If you have any questions about how to get some where, the receptionist will tell you the best, easiest and cheapest way to get there. Thank you for your kind review Maria! We are so happy that you enjoyed your stay with us! Your business is appreciated, and we hope you will choose to stay with us again the next time you're in town. Thanks again! Very rude night shift manager. Got there around 2 p.m. Said there was a staff shortage and room would not be ready until around 4 p.m. Walked around for two hours and went back. She was rude again. Went to eat dinner and came back to another staff member who got us in our room. Customers will be understanding of the staff shortage if you speak to them in a friendly manner, which she evidently doesn't possess. I have stayed at many Best Western hotels throughout the U.S. I am not fancy, but this hotel does need an update. The price is to high for what you get. Thank you. So I have mixed reviews about our stay here at Sure Stay by Best Western. Upon our arrival the front desk clerk was extremely friendly & helpful however it seemed like EVERY time we walk by she was outside smoking which in my opinion is not a great look for your hotel. We chose this hotel because we were hoping we could walk to everything in Gatlinburg as we didn't want to have to drive & we could but it was quite a walk as we were down at light 10 & a block back but we were ok with that. Now for the room, the beds seemed clean & they were comfy however that was the only thing that felt really clean to me. The room could definitely benefit from a good clean. I would NOT walk on the floor without shoes on because the floor just looked gross. The bathroom wall had a large clump of dried toothpaste from the previous people who stayed...again gross. If we could see that why couldn't those cleaning the room??? We did tell the front desk & they cleaned off the clump but left they rest, I'm confused??? I feel like they just need some new housekeepers who know how to REALLY clean or maybe give them more time to do their job. We always had hot water for our showers and the free breakfast was decent. Would I stay here again...good question...I would definitely look to see what other hotels are available first before coming back. Thank you for taking the time to rate us. Your input is very important to us and will be looked into. Please be assured that we are making regular updates to the facility. The carpets are one of the big projects that we have planned. We have plans to replace all of the carpets throughout the hotel sometime this winter. We hope you will find the accommodations much improved should you choose to stay with us again in the future. Thanks again! "Good price but bad room"
Usually we enjoy Best Western. But this is a cut-rate motel. 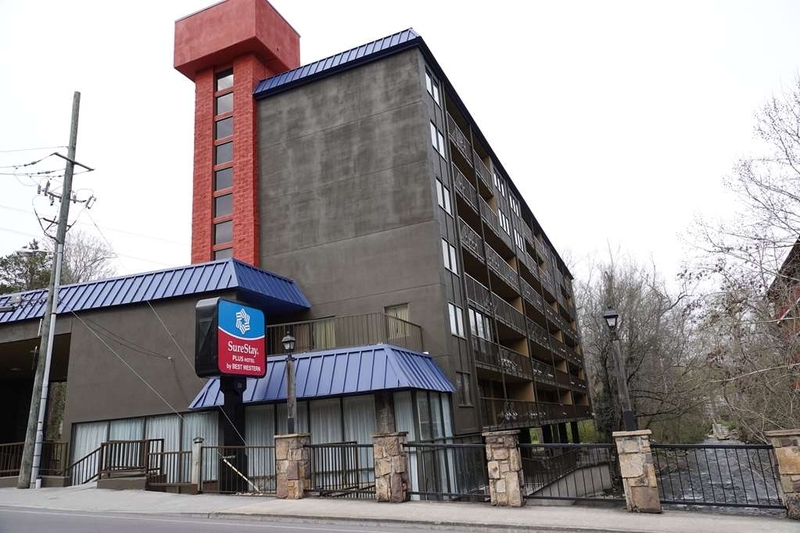 They tried to fix it up after the Gatlinburg-area fire a couple of years ago, with fresh paint and perhaps new mattresses. But our room smelled musty. Broke lamp fixture over the sink. Tiny bathroom. Windows with cracked seals. The only good thing was breakfast.. and of course the lower price than surrounding motels. Next time we'll pick a higher priced motel. Thank you for taking the time to rate us Julie. We deeply regret that you were not pleased with your room. We will be sure to look into your complaints. Please be assured that we are making regular updates to the facility and we hope you will find it much improved should you choose to try us again in the future. Thanks again! The hotel seems to be in improvement phase. The room was spacious and beds comfortable. The room has a balcony with 2 chairs overlooking the river and to view some mountains. It is a shared balcony with your neighbor. You can see the hotel is making improvements and the room was clean. The breakfast area was nice and breakfast was decent for free:) The pool is on the smaller side, but fine for younger ones. We were able to walk into town and not move the car. It is an average hotel with friendly staff. Thank you for taking the time to rate us. Your input is very important. 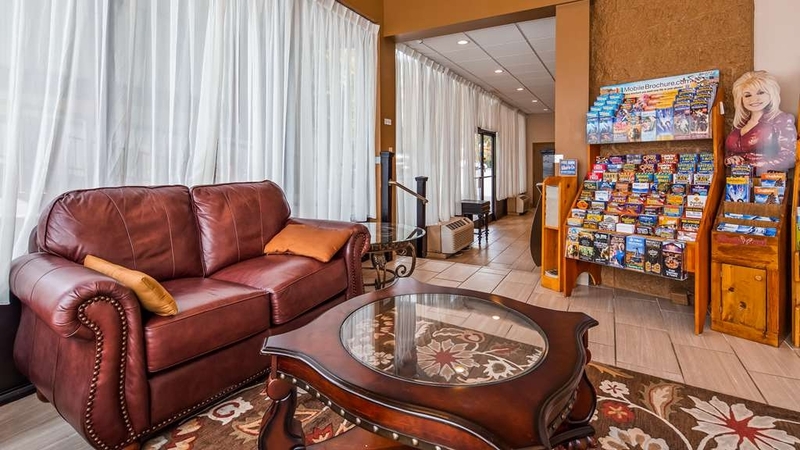 We are pleased that you found your stay both convenient and comfortable. 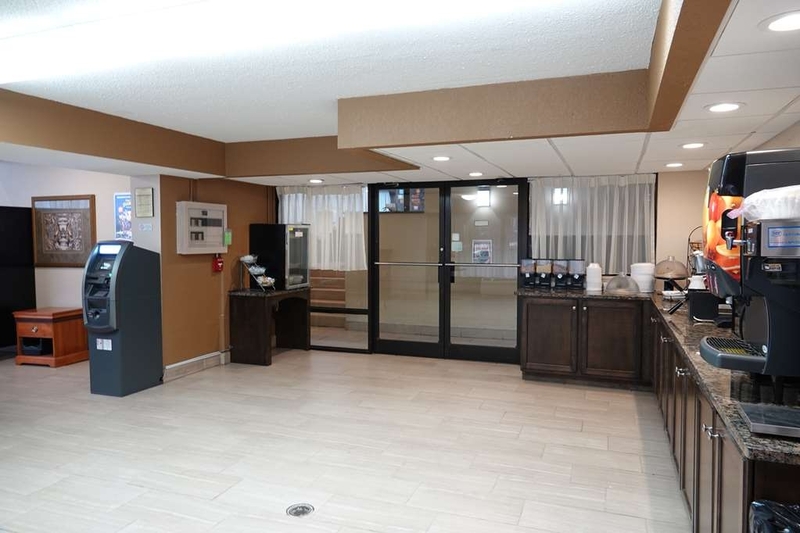 You are correct in noticing that we are making regular improvements to the facility and we hope you will find the accommodations even better should you choose to stay with us again in the future. Thanks again! Nice hotel for the price. It was older but the room was huge and clean. Beds were also comfy. Very small pool with only 10 person capicity but it looked clean and well kept. The main problem was the staff!! I asked for a roll of toilet paper and she handed it to me and said here is your sh** tickets. She proceeds to use that word almost every other word! They also do not have a plan in place for severe weather. We were on the top floor with tornado warnings all around us so I asked the front desk clerk if there was a plan in place or somewhere to go and she told me "No, I guess you can get in the breakfast room and go under the tables" Really??!! Also it is right off the parkway (a block) but it is at the very end of the parkway at the last red light before you go into the park so it is still a little bit of a walk to everything. Will not stay again strictly because of the lack of professionalism! Thank you for taking the time to rate us. We are pleased that you found your stay comfortable. We apologize for the experience you had with the front desk person in question. We will be sure to address this with said staff member. We assure you we hold our staff to a higher standard than what you have described. Your business is appreciated, and we hope you will choose to stay with us again the next time you are in the area. Thanks again! The motel was very clean and very nice people that worked there. The fridge did not get cold and the 2nd TV did not have a remote however I told them that and that same evening the fridge was very cold and we had a remote for the 2nd TV. The room was a suite and it was huge. If I get to Gatlinburg again I will stay at this hotel. The best hotel for the price that I have been to in the last few years. if you are picky about hotels I would say stay here. Thank you for your kind review! We are so happy that you enjoyed your stay with us! Your business is appreciated, and we hope you will choose to stay with us again the next time you're in town. Thank you for choosing to stay with us here at Sure Stay Plus Gatlinburg! This hotel is gross. I have nothing good to say. Extremely over priced for the condition of our room. It's extremely disappointing for a Best Western hotel. Our room was NOT ready when we arrived at 5:30 p.m. They were frantically "cleaning" it while we waited outside of our room. We paid $146 for our room. It wasn't worth $40 for a night. These rooms NEED some serious deep cleaning and major updating. The bathroom looked like a nasty public bathroom. Multiple layers of wall paper showing through above and below the mirror. Broken furniture shoved in front of a fireplace. Dead bugs on the carpet. Rusted light fixtures. Large sections of wall missing paint. Windows so dirty you couldn't see out of them. The doors were chipped and dirty. Also,there was no hot water for showers. It doedmt even start out hot! They could also use more front desk staff or someone that is more efficient. Thank you for taking the time to rate us Rhonda. We regret that you did not enjoy your stay with us. Your input is very important to us and will be looked into. Please be assured that we are making regular updates to the facility and we hope you will find the accommodations much improved should you choose to stay with us again in the future. Thanks again! "Quiet yet close to the strip"
Thank you for your kind review! We are so happy that you enjoyed your stay with us! You are correct in noticing we have made several updates to the room and property and are planning to continue renovations throughout the year. We are confident you will find the accommodations even better when you come back to stay with us again for New Years. Your business is appreciated, and we look forward to seeing you again the next time you're in town. Thank you for choosing to stay with us here at Sure Stay Plus Gatlinburg! Well this must be one of the oldest motels that Best Western has in their inventory. Very old worry some elevator. Almost made me want to take the stairs to the 7th floor. Very vintage decorated rooms that could use some updating. Nice balcony that did not have a wall/fence to prevent the ones in the next room to walk by out balcony window!. Even had old cigarette butts just dumped out on the balcony floor that were not picked up when the units were cleaned. And the riser in the toilet was broken so water was running all thru the night!! Thank you for taking the time to rate us Glenn. We deeply regret that you were not pleased with your room. We will be sure to look into your complaints. Please be assured that we are making regular updates to the facility as we continue our transition to the Best Western brand. We hope you will find it much improved should you choose to give us another chance in the future. Thanks again for your review, your feedback is much appreciated. I use Best Western Hotels when ever we go on trips and stay at them 10 to 20 nights a year. This was by far the WORSE one ever. We checked in of Friday evening and noticed the room had a heavy smell of carpet fresh. My wife looked on the bathroom and noticed hair and soap scum in the tub / shower. The room was large and most likely a suite at one time but the florescent lights are ill placed in the ceiling and there was one long one with no cover over it. The carpet has a burn mark from an iron and another place it was fraying. When we opened the curtains to see the river the windows were so dirty you can hardly out. It looks like they were never cleaned or something got between the two panes of glass. The were all like that, not just one. When we went to step out on the balcony we noticed there was no privacy and it is shared by two other rooms. At night there are lights you could not turn off from our room and millions of bugs flew around the lights so you could not even sit outside and enjoy the river below. We started looking for a different hotel and made a call to the front desk about the bathroom. The person at the front desk did come up and clean the tub / shower and apologize. The next day I dropped some ice on the tile floor and my wife went to clean it up and the wash cloth was BLACK. Needless to say we walked around with shoes on the rest of the weekend. As a Best Western Diamond Points member this was THE WORSE. I hate to say but when in Gatlinburg again we will be staying at the Hilton or other hotel. Decent location, 2 minute walk to the Gatlinburg Trail.This place is marginally clean. The only reason I would call them dog friendly is because they allow dogs to stay. It is not set up in a dog-friendly accessible way. Because the hotel is next to the waterway, there are no 1st floor rooms. All rooms are 2nd- 7th floor. This was a huge inconvenience for me and I wouldn't have booked it had I known. The elevator is old and clunky, which scared my 2 dogs. Imagine convincing 2 80 lb dogs to use an elevator they're afraid of, every time they have to potty. The potty area was not mowed and was covered with debris. Parking lot was very hot and my dog sustained a burnt paw while getting into the car to leave. Staff tried to be nice, and patient, but I was clearly disappointed and they struggled after bit, but still kept their cool. The room itself was large with a shared balcony. The room smelled of humidity and carpet cleaner. The remote was sticky, bathrooms marginally clean. Food under sofa, etc. Thank you for taking the time to rate us. We deeply regret that you were not pleased with your stay and did not feel that our property accommodated your dogs. We will be sure to look into your complaints. Please be assured that we are making regular updates to the facility and we hope you will find it much improved should you choose to try us again in the future. Thanks again! Decided to go down to Gatlinburg a day early for cabin. Want ahead and booked their sweet. With kids ended up costing about $220 for one night stay. We all slept in our clothes because the place was so filthy. Got switched out of our first sweet to the second sweet because the first week was so filthy second sweet just is filthy. I was told by the manager at the rooms are as clean as they can have them. I was told they're having problems with their cleaning staff. Would never ever stay or recommend this hotel. There were hairs all in the bathroom pieces of chicken in the couch the Jacuzzi was clogged with a hairball. If you read one review read mine. Do not subject your family to this hotel. Thank you for your kind review Herbert! We are so happy that you enjoyed your stay with us! Your return business is appreciated, and we hope to see you again the next time you're in town. Thank you for choosing to stay with us here at Sure Stay Plus Gatlinburg! "Didn't want to be in our room"
$166 for a queen suite that was dark, creepy and outdated. The check in lady made sure to ask me and the other guests if we had dogs but she wasn't forthcoming about why she was asking - the $25 pet fee applied to the final bill. Like with everything else in this hotel, there was a very "we-only-work-here" kind of attitude. Time to call corporate on this one - if they even care. Thank you for taking the time to rate us. We deeply regret that you were not pleased with your room. We will be sure to look into your complaints. We apologize for any miscommunication about our pet policies. We will be sure to discuss with staff the need to improve communication in this matter. Please be assured that we are making regular updates to the rooms and facility and we hope you will find it much improved should you choose to try us again in the future. Thanks again! 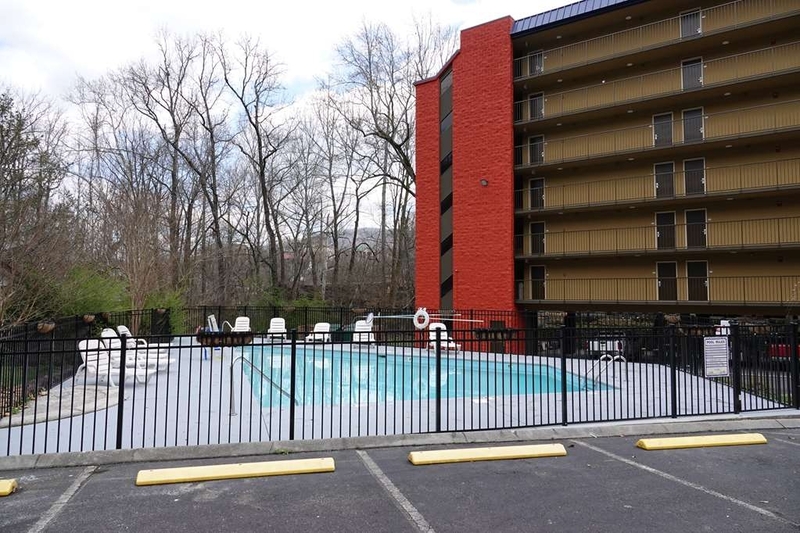 Great location away from the hustle and bustle of downtown Gatlinburg . Quiet area. Lots of parking. Comfortable bed. Located along a river/creek which you cannot see from your room, but can when you lean over the balcony railing. The room we had was very outdated and dirty. The bathroom had a new shower stall. Lighting was poor. The windows were filthy and you could barely see out of them. Staff did not seem to know what they were doing and had very poor PR skills and obviously lacked training or weren't trained at all. Breakfast was a joke. Not enough food and very poor service. Tables not kept wiped and food brought from somewhere in zip lock bags. Check in and out left much to be desired. Won't stay here again. Thank you for taking the time to rate us. We deeply regret that you were not pleased with your room. We will be sure to look into your complaints. We also apologize for the chaotic environment that was going on during our brand change over. Things have settled and are running smoothly now. Please be assured that we are making regular updates to the rooms and facility and we hope you will find it much improved should you choose to give us another chance in the future. Thanks again! "Survivable for a night, but not recommended"
The 4 pet friendly hotels we stayed in previous to this on our trip did not charge extra for pets and were legions nicer. We chose this place because of it's good rate on our app, but with a $25- upcharge we could have stayed at one of the nicer pet friendly places, had we known. When politely asking the lady at the front desk if a compromise could be made she was unyielding. The rooms were okay, but not super clean. The old, clouded over, inoperable windows did nothing to highlight the neat river view just outside them. The bathroom smelled like an ashtray and was dirty. I wanted to spend as little time in there as possible. The big toenails between the nightstand and the bed were especially charming. For the price we ended up paying I could have done MUCH better in Gatlingburg. We were disappointed. Thank you for taking the time to rate us Maggie. We deeply regret that you were not pleased with your room. We will be sure to take your complaints into consideration. Please be assured that we are making regular updates to the rooms and facility and we hope you will find it much improved should you choose to try us again in the future. Thanks again! Our reservation at another place got cancelled so we had to find another place fast. We booked onilne because it was literally one of the only rooms left in town. They have apparently had a name change and the staff was not familiar with the new software so it took a bit to check in. The whole place looks like a older hotel with a coat of paint. The room was ok. The balcony over the river was nice but it would be nicer if it was private. The housekeeping was hit or miss. Some days they would not empty the trash, others they didn't make the bed ,but they always left towels . It was clean on the surface but I didn't look very close. Over all I would stay there again,but it wouldn't be my first choice.When on vacation all I need is a place to shower and sleep. The price is right. Thank you for taking the time to rate us Gary. Your input is very important to us and will be taken into consiteration. Your business is appreciated, and we hope you will choose to stay with us again the next time you are in the area. Thanks again! Long day in the car traveling from WI. Kids are tired, mom and dad just want to go to bed to get up for an exciting sunrise Easter service!! Ahhh, finally at the hotel that had decent reviews only to get beyond irritated when walking in you immediately know this is/was a mistake! Getting in the elevator should have been clue number 1. Hostess entered saying that she is so sick of dealing with people, but we should have a great night and she'll be there till 11 if we need anything...ok? Really? Ok, so sluff of the cranky lady that is to represent the business and get on with our stay, after all it is only one night. Door was unlocked to the balcony, ok again not a huge deal, but then you look around and see that the mirrors in the room are filthy. Walking to them, the tile is sticky, carpet feels gross enough I wont let my kids walk barefoot... Ok, take pics and post a not so friendly review. But then I see that the 'housekeeping service' surely didn't forget the TIP envelope , but low and behold they didn't change the [email protected]! Sheets with URINE saturated and with black hair that is clearly not from my family! More investigation just proves no one actually cleaned this room. Bathtub looks disgusting and i really need to shower. Ugh!!! Really crappy start to spring break. No thanks to this dump....$160 I could have spent elsewhere while feeling more comfortable sleeping in my car! Thank you for taking the time to rate us Renee. We deeply regret that you were not pleased with your stay. We will be sure to investigate your complaints. Your business is appreciated, and we hope you will give us another chance in the future. "Dirty room and poor housekeeping"
After we checked in and went to our room. At first it appeared great value for money, then we noticed the dust everywhere, mould or limescale all around the toilet and the worn, dimly lit shower cubical. Housekeeping came once to replace towels over a 3 night stay, no bedding was made or changed and the bin wasn't emptied. A/C was very temperamental and we woke up very warm in the night where it hadn't started And to top it off, house keeping didn't knock just before us leaving to check out on the final day. They came straight in and caught my wife standing there naked! I would recommend spending slightly more money elsewhere for a lot better standard. Thank you for taking the time to rate us. Your input is very important to us. We apologize for any housekeeping issues with your room and will discuss with staff. Your business is appreciated and we hope you will choose to give us another chance in the future. Thanks again!